There was a time when I spent most of my waking hours in nightclubs, working and playing. Many of those hours were spent with Arthur Weinstein, who died last week. Those who only go to clubs to party have no idea how desolate and malodorous those sparkly venues are when they're closed. (For a better understanding, visit Clublife, and buy the book of the same name; you'll be glad you did, though it's not for the faint of heart.) Arthur could walk into any empty space and imagine it full of beauty, and fabulous people, and know exactly whose those people should be. The Times obit's headline described him as "starter of nightclubs." That was true, but he also knew how to keep them exciting. He started Hurrah, which was my first home away from home (and which I could walk to my apartment from, no matter how late or how inebriated I was), the wonderful after-hours clubs The Jefferson and the Continental, and, with Frank Roccio, the Lower East Side's crumbling palace The World. Frank is long gone, and now Arthur is too. I hadn't seen him in years, but I miss his wit and style, and my heart goes out to his long-suffering wife of more than 30 years, Colleen, and their daughter Dahlia. New York nightlife in those days seemed like it was the center of the universe, though perhaps the denizens of nightclubs in any era feel that way. 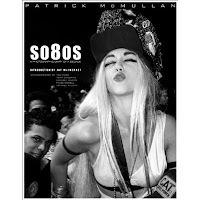 But look at Patrick McMullan's book so80s, and maybe you'll understand. I see ghosts on almost every page.